Perfect relief for babys gums! This double ring soothes and stimulates babys inflamed gums. The two soft rings are liquid-filled for chilling, and after refrigeration, when baby chews them, the cold anaesthetises the pain caused by teething. Both rings are also textured, to gently massage babys gums. 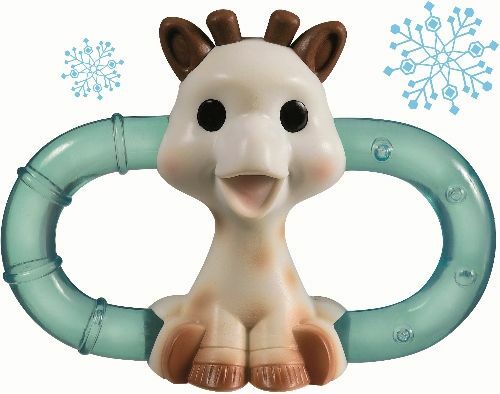 The Double Ice Bite Teething Ring combines soft chewy parts (ears, horns, rings) with parts that are harder to the touch, to provide a variety of stimuli. The two handled design ensures that Baby can easily grasp and manuipulate this teether.